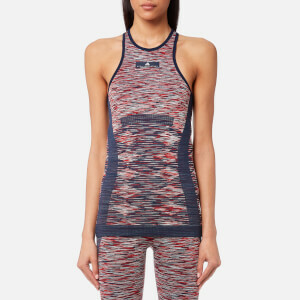 Seamless training tights from adidas by Stella McCartney. Innovative Climalite technology delivers moisture-wicking properties to help keep you cool and dry during workouts. Cut from stretch fabric with a 'second-skin' feel, the mid-rise leggings feature a ribbed, elasticated waistband and colour-block jacquard striped details. Open mesh panels enhance ventilation. Complete with rib-knit cuffs and signature logo branding throughout.